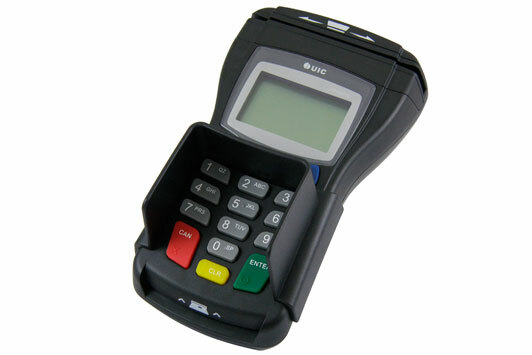 The PP790SE is a versatile payment PINpad that conforms to PCI, Interac, EMV standards and meets the highest levels of security by encrypting every transaction using Triple Data Encrypted Standard (TDES), Advanced Encryption Standard (AES), Rivest, Shamir, Aldeman (RSA) Standard, Secure Hash Algorithm-1 (SHA-1) and Derived Unique Key Per Transaction (DUKPT) key management and Message Authentication Code (MAC). PINPAD790, WITH 3 TRACK MSR, IC CARD READ/WRITER, USB, 3-SAM SOCKETS, USB CABLE, NO POWER ADAPTER, PRIVACY SHIELD, BACKLIGHT LCD, RoHS. Requires key injection in order to accept debit or credit card payments. Please call for more information. PINPad with 3TK MSR, IC card Read/Writer, USB, 3-SAM sockets, USB cable, no Power Adapter, Privacy Shield, backlight LCD. Requires key injection in order to accept debit or credit card payments. Please call for more information. PINPad with 3TK MSR, IC card Read/Writer, RS-232, 3-SAM Socket, RS-232 cable, Power Adapter, Privacy Shield, backlight LCD. Requires key injection in order to accept debit or credit card payments. Please call for more information. RFID Module (M-chip) RSA. Requires key injection in order to accept debit or credit card payments. Please call for more information. PINPad with 3TK MSR, USB, 0-SAM sockets, USB cable, no Power Adapter, Privacy Shield, backlight LCD. Requires key injection in order to accept debit or credit card payments. Please call for more information. PINPad790, with 3TK MSR, RS-232, 0-SAM sockets, RS-232 cable, Power Adapter, Privacy Shield, backlight LCD. Requires key injection in order to accept debit or credit card payments. Please call for more information. ACCESSORY, PP795/PP790/PP190/EPP790/UIC680/BEZEL8 100 VAC-240 VAC POWER SUPPLY, 5 VOLT OUTPUT, CEC6.